Mac Bulk SMS Software for Android Mobile Phone allows you to send bulk number of text messages from your Android technology based mobile phone connected with MAC. Mobile text messaging software allows you to communicate with your customer, staff, friends and family by broadcasting multiple text messages from your Android phones. 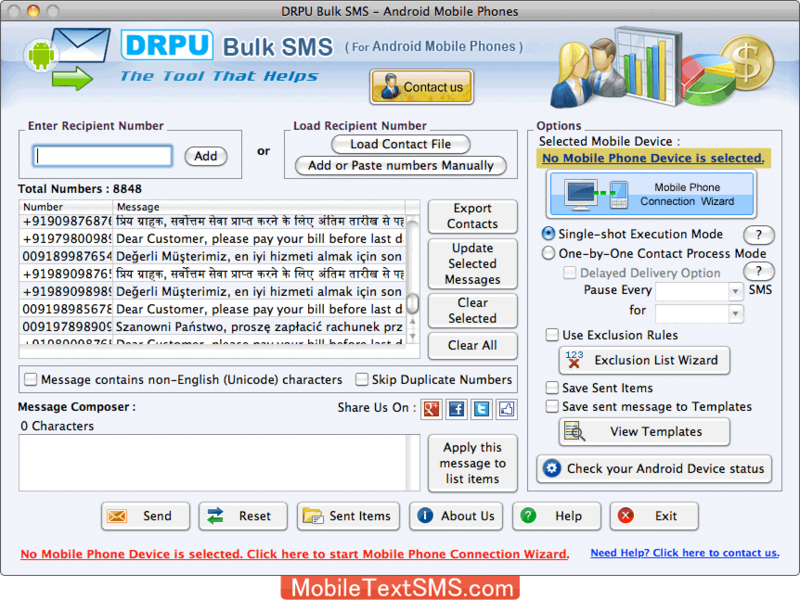 Mobile text SMS program provides facility to load multiple contact numbers from MAC (which is saved in text file format) for sending bulk text messages. Bulk SMS messaging program is mobile marketing solution that helps to promote your products and services by sending group SMS. Sends multiple messages: Mac text SMS sending program send multiple SMS to single or list of contact numbers using android mobile phone. Save sent text messages details: SMS Gateway software saves your sent messages details so it’s easy to track sent SMS. Provides option to skip duplicate contact number entries: Android SMS apps for MAC provides option to skip duplicate contact number entries while sending bulk SMS from Android phones connected with Mac machine. Sends bulk SMS in different text: Android SMS sender application for Mac delivers text messages in any text format over worldwide location within minimal time. No internet connection is required to broadcast sms: Cell phone sms broadcasting programs provide fast delivery of text messages across the world without requiring internet facility.